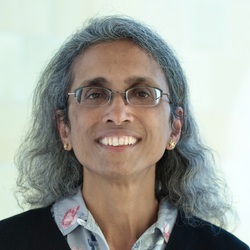 Dr. Loki Natarajan is a Professor of Biostatistics in the Department of Family Medicine and Public Health at UC San Diego. She was trained in pure mathematics and has over 10 years of experience as a statistical co-investigator on multiple epidemiologic studies and clinical trials in cancer. Her research interests include developing validated prognostic models for long-term disease-free survival incorporating behavioral, genomic, demographic and clinical factors. Outside of work, she enjoys hiking with her family, gardening, reading, and singing (to her cat).